NOTE: Because of recent buyer abuse of the Return Refund Policy, Returns are NOT accepted UNLESS there is a MAJOR inaccuracy in the listing description. A restock fee of $2.50 + 10% of final value price is charged. Notification must be given within 48 hours of receiving your item. Product must be returned within 7 days of notice, in the same condition received, to receive a refund. Shipping is not refundable. Refunds will be given as store credit and must be used within 60 days. SO ASK ALL QUESTIONS BEFORE YOU BID. 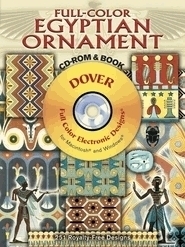 Full-Color Egyptian Ornament:OVER 250 CLASSIC DESIGNS-CD-ROM/BOOK-LOTUS BLOSSOMS AND CHARIOTEERS TO PORTRAITS OF EGYPTIAN ROYALTY; FULL-COLOR ELECTRONIC DESIGNS FOR MACINTOSH AND WINDOWS. Over 250 classic designs — from repeating lotus blossoms and charioteers to portraits of Egyptian royalty, this splendid archive showcases the beauty and exotic appeal of ancient Egyptian art. Male and female figures, royalty, plants, animals, geometric motifs, and more — all meticulously rendered from authentic sources — represent a superb source of eye-catching illustrations. Ideal for a host of practical uses and design inspiration, the collection will be valued, as well, by students of Egyptian art and culture. Dover Original. Image File Information: Includes 251 images scanned at 300 dpi and saved in TIFF format. ISBN 10: 0486996794 ISBN 13: 9780486996790 Author/Editor: Dover Page Count: 48 Dimensions: 8 1/4 x 11 Publication date: November 2005 DOVER NOTE: This book was printed in the United States of America. Dover books are made to last a lifetime. Our US book-manufacturing partners produce the highest quality books in the world and they create jobs for our fellow citizens. Manufacturing in the United States also ensures that our books are printed in an environmentally friendly fashion, on paper sourced from responsibly managed forests. SEE ALL MY DOVER CD-ROM/BOOKS. I COMBINE SHIPPING!